NextSarah McLeod – ‘Rocky’s Diner’ album review. In the early to mid eighties when I was a kid I was obsessed with tennis. The back of my bedroom door was covered with newspaper clippings of two of its biggest stars. One was the unapologetic New Yorker, John McEnroe, arguably the sports most divisive personality and showman, with a serve and volley game rarely matched during his zenith. Today, we throw around words like tortured genius to describe his remarkable career. But then there is that other tortured tennis genius, arguably the most talented player of her generation, who remarkably shared an equal amount of space on my bedroom back door. Her name is Hana Mandlikova. While everyone was mesmerised by the gorgeous Chris Evert, I payed attention to the grace and free-flowing spirit of Hana. Mental toughness and injuries aside, she was truly an incredible athlete. She won 27 tour events, which included four coveted Grand Slam championships – 1980 & 1987 Australian Open, 1981 French Open and 1985 US Open. Like her male counterpart, McEnroe, she had a terrific all round game. When she was on fire, she could match and beat the world’s best. She was quick on her feet, power punched with an amazing one-handed backhand and used angles on the court that many of her opponents didn’t believe was possible. Interestingly though, for most of her career, she was unfortunately overshadowed by Chris Evert and Martina Navratilova. If not for these two greats, I truly believe Hana might have easily won a few more grand slam titles. (She was a semi-finalist or runner-up in no less than 10 Gland Slam events between 1980- 1987.) To add further insult to injury, her critics occasionally labelled her arrogant and ungracious. It is true that her straightforward demeanour and bluntless proved an obstacle for her from time to time. That said, I kind of amusingly recall the Wimbledon semi finals of ’84, where an inspired Chris Evert crushed Hana 6-1, 6-2 to reach the final against Navratilova. After the game, Hana was apparently convinced that Evert was intentionally taking far too long packing her gear at courtside, soaking in the important victory, “to give me one more kick after she beat me,” Mandlikova was quoted saying, and completely walked off centre court without waiting for Evert. For her efforts or lack of, Mandlikova received not only a barrage of criticism from the English media, but did herself no favours with her fellow competitors who thought she had little or no respect. To her credit, over the years she did her best to work on those issues, especially given her Czech upbringing, where her disarming frankness was part in parcel of a way of life for her. She often said exactly what was on her mind, whether it was during her school years or on the tennis circuit, without a thought that her candor would often bite her back. Mandlikova has admitted through many interviews that she was a spoilt kid and that her arrogance comes from her lack of life experience. I am reminded of how unbelievable Hana’s tennis game had developed under Stove, when she dumbfounded her critics and became the first woman since Tracy Austin to beat both Chris Evert and Martina Navratilova in the same tournament, when she beat World No.1 Evert 4–6 6–2 6–3 in the semi-final and World No. 2 Navratilova in a mesmerizing 7–6 1–6 7–6 final at the 1985 U.S. Open. It fair to say that my unashamed admiration for Hana grew to new heights that summer after her grand sweep over two champions in Evert and Navratilova in successive days. For me personally, Hana’s astonishing 1985 US Open triumph ranks alongside Greg LeMond’s incredible comeback at the 1989 Tour de France. What is interesting about 1985 in women’s tennis was that Martina Navratilova and Chris Evert’s dominance was undisputed. For a better part of ten years between 1975 and leading to the start of the 1985 US Open, Evert or Navratilova had a grip on most of the major championships and held the top two ranking positions in the world between themselves. You could bet “If Martina or I are entered in a tournament, there’s a 95% chance that one of us will win it,” said Evert in the first week of the 1985 US Open. Such was their confidence that Navratilova and Evert for instance had reached the final of the French Open in 1985 without losing a set or even playing a tiebreaker. They were certainly big time players in all the most important tournaments. To Mandlikova these were fighting words. But with the confidence of an early win against Evert, despite Evert’s unwanted commentary, she took her good form to the US Indoors at Princeton, in the process knocking over Naratilova in the semi-finals in straight sets 7-6, 6-0, to win her second tournament of the year. With two titles now under her belt, the 1985 season was truly shaping up to be a potentially important year for Hana. All she needed to do was maintain her consistency and positive mental approach to tennis. Though things unfortunately didn’t go to plan mid-year, as Hana faltered at the championships bowing out in the quarter-finals at the French Open and the third round at Wimbledon. But it wasn’t time to panic. Hana’s coach Betty Stove still believed that Hana was on the cusp of realising her full potential, as Stove continued to cherry-pick Hana’s schedule that, combined with the groundwork of a vigorous training, would give Hana a perfect springboard at an assault on the US Open. The 1985 US Open began in blistering speed for Hana, as she cruised through the opening week without too much difficulty. Her rivals in Evert and Navratilova did the same quite convincingly too. The quarter-finals were again routine for the top three seeds, but everyone believed that Evert and Navratilova, who frequently found themselves at the business end of tournaments, would inevitable both meet in the final, even before a ball was hit in the semi-finals. But it appeared that someone forgot to tell that to Mandlikova. She was starting to play well again, she had great physical strength, the right attitude and her technique was sublime throughout the tournament. She truly believed she could beat Evert in her semi-final and Navratilova if given half the chance. Her critics were not so optimistic and who still considered her to be the heiress apparent to Evert and Navratilova. Nonetheless, September 7th, 1985, was to be the first of two successive days that professional women’s tennis was turned on its head. At first things went according to plan for Evert, who held an 18-3 win record at the time against Hana, by taking the opening set 6-4. But Hana rallied back with her typically aggressive serve and volley game to crush Evert and maybe her spirit by taking out the game 4-6, 6-2, 6-3. Looking back the sixth game of the final set, which saw it go to deuce 12 times before Hana broke Evert’s serve was arguably the most thrilling and decisive game of the match. And try, she did. Like a sprinter blasting out of the blocks, Hana raced to a 5-0 lead in the women’s final after 17 scintillating minutes. “She was just swinging, hitting winners all over the place. It didn’t matter what I did. First serve, second serve, stay back, come in–she just kept hitting winners.” said an absolutely stunned Navratilova before she eventually turned the tables on Hana. Whispers around the court began to circulate that Hana’s reputation for wilting under pressure was only a matter of time as Navratilova won the next five games. But the Hana of 1985 was a little wise and stronger than the Hana of old. She anchored herself on the other side of the net eventually taking out the first set 7-6 in a tiebreaker. And do it, she did, as she raced to a 6-0 lead in the tiebreaker, en route to a 7-2 win. Hana would fall to her knees and roll onto her back, in absolute elation and relief. Fast-forward to Wimbledon in 1986 and Hana had the opportunity to rewrite history by beating Evert and Navratilova again in the finals. She upset Evert in the semi-final, with some claiming it was her way of avenging her lose to Evert in the 1981 Wimbledon final. With phase one of her demolition job complete, of ousting Evert from the tournament, only Navratilova stood in her way in the women’s final. Unfortunately, a determined and lively Navratilova was equal to the task, beating Mandlikova in straight sets 6-7, 3-6. In fact, ever since Hana upset Navratilova in the previous year at Flushing Meadows, Navratilova made it her life’s mission to not lose to Mandlikova again. Between late 1985 to September 1989, both players met 16 times with Navratilova’s win record in that period standing at 15-1. If it was any sort of consolation for Hana, her single solitary win between 1985 and 1989 against Navratilova came in the 1987 Australian Open. In that final, Mandlikova had to learn all over again how to counter the domineering Navratilova. In short, Hana took advantage of Navratilova’s wayward game and returned serve particularly well to capture her second Australian Open 7-5, 7-6. In a horrible twist of fate a few months following her Australian Open triumph recurring injuries caught up with Hana sending her career into an untimely decline. The accumulative effects of discovering she was pregnant and pressure of having a successful career also saw Hana have to choose between being a mother or a fulltime tennis player in 1987. (A year earlier Hana vowed “I still plan to give up tennis in time so that I can have children and master the everyday life that in the end awaits even the best tennis players.”) She chose to terminate her pregnancy during her absence from the 1987 Wimbledon championships, and so it seemed too, Hana still had some unfinished tennis business, in particular, her lifelong dream since she was a little girl of winning Wimbledon. Hana’s comeback in 1989 showed some of the fleeting genius she was capable of. But ultimately, she was a shadow of her former self on the tennis court. In short, her mind began to wander and her body wasn’t capable of remaining injury free. Just before the 1990 Wimbledon championships, the 28-year-old announced she was retiring from tennis. I remember vividly mourning the day Hana walked away from tennis for good at least as a player. 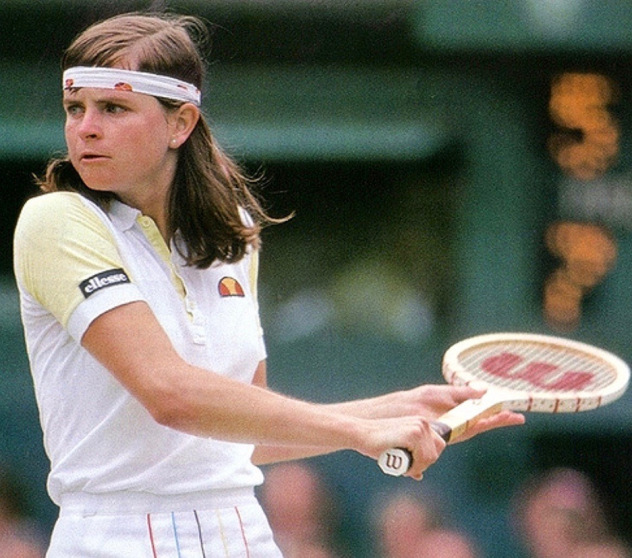 Now 55, Hana Mandlikova is an International Tennis Hall of Fame inductee. She is also a tennis mom with two 14-year-old twins, Elli and Mark, who posses similar styles to their famous mother. As for Hana’s unfulfilled dream of not winning Wimbledon, she was instead able to share in the joy of helping coach Jana Novotna to win the 1998 Wimbledon Championship. For nine years, Hana helped mould the mentally fragile Czech-born Novotna, into an aggressive and decisive player capable of winning the Grand Slam title, Hana herself failed to win. One of my favourite moments at the end of Novotna’s Wimbledon victory was when after falling to her knees, Novotna raced up into the stands and climbed over the family box, where she fiercely hugged Hana to whom Novotna dedicated her triumph. Despite sometimes being dubbed the John McEnroe of women’s tennis for her own fair share of bad behaviour, Hana’s semi-brilliant career as player and coach are what sporting dreams are made of. Being able to fulfil her potential to the best of her ability, despite being overshadowed by tennis greats in Evert and Navratilova, is proof enough that this wonderful individual deserves her place among the greats of tennis. Personally, I hate that many commentators still look at her as a underachiever who could have done more. But how do you combat a generational change of hard-hitting new talent and an accumulation of debilitating injuries that Hana faced throughout her career? I think Hana was brave to call it quits when she did at the age of 28. Like she said, in not so many words, there is more to life than just tennis. Still today, she stands as my favourite female sporting hero! Acknowledgements: My own memories of old interviews and footage of Hana Mandlikova are vague at best. Therefore, the advent of You Tube has helped reawakened many wonderful memories and I am indebted to all those who have uploaded her wonderful tennis matches. More importantly, I owe a lot to the dedicated journalists who would discover almost everything there is to know about Hana Mandlikova. Considerable time was spent reading and researching various digital archives from – The Guardian, Daily Mail, Los Angeles Times, New York Times, Sports Illustrated, and Trove – National Library of Australia – to name a few. Big thanks to Hana who was willing to be interviewed over the years, which allowed me to use her own words for this featured article. Photo Credits: I am unsure of the copyright status of the header image of Hana playing at Wimbledon. I make use of the images under the rational of fair use. It enables me to makes an important contribution to the reader’s understanding of the article, which could not practically be communicated by words alone. The autographed B & W image of Hana is used under the Creative Commons Attribution-Share Alike 3.0 license. I am not the uploader of the You Tube clips embedded here. Growing up, I didn’t watch Hana play, she had not retired yet, but Steffi was already the queen of the game and the little tennis available on TV in Lima only showed the occasional major final and it was always Steffi, Monica, or Gabriela. It’s amazing how nowadays players can perform at top level well into their 30s. It gives us hope that we can stay young forever! Steffi Graf is one of my all time favourite tennis players. But Hana is, of course, my favourite sportswoman of all time. I really should do my top 10 tennis players of all time some time next year. I hope Marcelo “Chino” Rios makes the cut. One of the most talented and fun to watch players, IMHO. Honestly I could have written this article! Not because of writing talent but because we share the same passion for Hana. I also had pics of her on my wall as a kid. And I remember screaming with excitement as I watched that 1985 final. I would particularly loved to watch the one and only match she played against Goolagong at the 1980 Wimbledon, even though Hana lost. But imagine the brilliance those two would have combined for when they were both on fire. As well as the sublime audacity when either or both were off. It must have been some match. Thank you Rod for your wonderful insight and enthusiasm. I am thrilled to see that I’m not the only one who adores Hana. I wish I could go back to experience that great 1985 final. What a wonderful sporting moment, but also the story behind her triumph.